His past is almost totally unknown to him and Arc has spent much time looking into it. What little detail he has found cannot be truly confirmed yet and is at best unconfirmed. He spends more time focusing on the present now but any hints to his past are of great interest to him. Arc Thunder is a veteran hero who has been active for at least fifteen years, possibly twenty or more. He is currently an Agent with UNTIL with the operational rank of Brevet-Captain. He also (in some circles) is rumored to be an unofficial co-leader of the Prometheus Union. Arc's memory gets fuzzy and confused before 1996, he has absolutely no memory prior to Destroyer's destruction of Detroit. His first clear memory was walking along a highway into a small town and having a man come running up to him and using the name 'Arc Thunder' to refer to him. A few months later he was working on a farm and saved the owner's son by pushing him out of the way when a transformer post fell. Arc himself was unhurt by direct contact with the exposed wires and (re)discovered his affinity for electricity then. In thanks the father gave him an old leather trenchcoat which Arc can be seen wearing on occasion. He spent the next five years wandering, picking up day-labor jobs where he could and often living on the charity of others. On occasion he chanced upon thugs or villains and did what he could to help fight them, sometimes winning gratitude with the local people, sometimes getting less positive treatment and in one instance in particular he was actually chased out of town by some hardline anti-mutant activists. Arc won't give a specific date, he may not remember exactly when but about ten years ago (2000-2001) he came to Millennium City. Initially he tried to find a job, but work had dried up, most of the positions he might have filled were already taken. So he ended up homeless, spending his nights in shelters when there was room, in the alleys when there wasn't. He tended to frequent a particular soup kitchen twice a week, beyond that any opportunity for free food. He started to gain some favor and notoriety with people in the neighborhood when he stopped an attempted mugging. Several more times he stopped gangbangers from hurting the innocents in the area. He garnered the hostile attention of two gangs in the area, and their specific targetting of him forced him to lay low for some time. In the end their temporary alliance fell apart and the gangs clashed, seeing the imminent danger he chose to throw himself into the middle of it and ended up bringing the lead enforcers of both gangs in to the police. Little did he know that someone else was watching him. His actions had garnered the attention of several individuals, one was a man who had been hunting for him for the last fifteen years, another a far more mysterious individual. Hearing about someone robbing a bank not far from his neighborhood he decided to see what he could do to help. When he arrived on the scene he was startled to see a familiar face. One from the foggy period of time that he could half-remember. The man was the second person to call him specifically by the name 'Arc Thunder' on sight that he could remember. He spoke of working together before, of how much better Arc had been and how he was here to show him how inferior he was now. Arc, having no recollection of any of this and in shock at the oddly familiar person, was unprepared for the fight, though he managed to save all of the hostages but the one the man killed before attacking him. After this incident the Millennium City Police Department took him in for questioning and found that he was not on record in their system. Having only been recognized by other people as Arc Thunder he told them they might as well just call him that. He went through naturalization with the authorities, (re)learning history and the laws of the land and now carries the legal name Arc Thunder. He continued to live in Westside, chasing away gangbangers and occasionally running afoul of more powerful villains. All the while someone was watching him. Made connections, pushed through the authorization to naturalize him, they waited and watched. Eventually he registered fully under ASPRA and with UNTIL, initially using the older communications device they handed out but eventually he interfaced with it and added the encryption scheme to the cochlear receiver/transmitter implant's registry. A few months later (in 2009) the Qularr invaded, Arc fought in the streets not far from where Witchcraft made her stand, holding off a force trying to bypass the area until the Mothership was downed. Still, he largely remained in Westside and in the aftermath was able to find some work in the rebuilding effort. Mystery still surrounds the original drawing together of the group known as the Prometheus Union. Arc Thunder's first encounter was during a week in mid-June, 2010, an evening specifically. 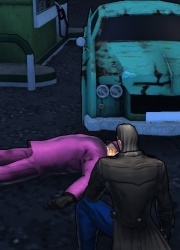 Arc had run afoul of a group of younger New Purple Gang thugs who were looting a convenience store in Westside, the store had been closed after a particularly violent battle between a Super 'Hero' and a Super 'Villain'. Arc had a hard time seeing the difference with as much collateral damage as had been caused by the 'Hero'. He took the thugs down with little effort, they were all standing in a pool of water after all. That was fortunate, as back then he didn't eat often or regularly enough to really keep his powers up. After calling in an anonymous tip to police he chose to stroll past one of the more popular pubs in Westside, Sherrerra's. He didn't go in, he never saw much point then what with no money and metabolizing it too fast to get drunk without poisoning. That particular night he was looking for one of the people that kept an ear to the ground about the movers and shakers (on both sides of the law) for him. Just as he'd spotted the guy lurking in an alley across the street a piece of paper blew on a gust of wind right into his chest. He grabbed it, glanced at it and was about to crumple it up and toss it away when he noticed the name he had been called at sight by two different people on it. Arc Thunder. He read the note over, several times, then crossed the street to talk to his contact. After some heated discussion and letting the man read the note, the informant mentioned a meeting with some young woman pertaining to the notes, apparently it'd happened the week prior. Now she was known to be hanging around the Renaissance Center and looking for more people who received the notes. After meeting with the young lady, a Jill McFarlane and one or two other recipients, he decided to look into it more. Given the recent confrontation with the man who identified him by sight as 'Arc Thunder' and the murkiness of his past he was keenly interested in finding out how someone could have arranged for the note to just happen upon him, and to have already known a name he was still getting used to himself. Arc spent more and more time around the people who had chosen to call themselves Prometheus Union, until he was finally convinced, if not still suspicious. After the meeting with Jill's father and the establishment of the Prometheus Union Tower as a haven, Arc chose to move off the streets and live there, working alongside the others for a time. Two big things happened late that summer, one a large number of local UNTIL agents were killed in a series of attacks, and two a group of terrorists began strategically taking down metas with specially tailored darts containing a mutation-reversion/power-suppression serum. Arc himself was taken down by one of these darts in the effort to save another hero and rushed to Mercy Hospital. 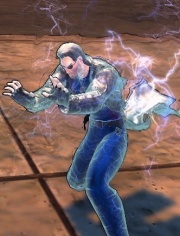 There he languished in misery for almost two weeks as his body weakened, and the effects of losing his healing factor with some of the unfinished cybernetic augments causing constant damage to his body nearly killed him. Luckily the hero Peacemaker was able to create an anti-serum to counteract and cleanse the agent from the systems of the heroes and people targeted by the terrorists. 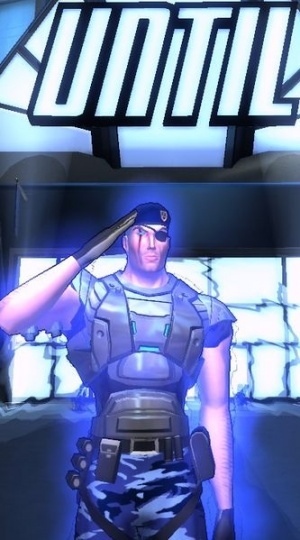 With the disappearance of Jill's father and the morale of the members of Prometheus Union broken by how hard they had been hit most decided it was better to part ways, many even retiring from any active hero-work. Arc, after taking some time to recover, went off to investigate his past feeling there had to have been some connection. 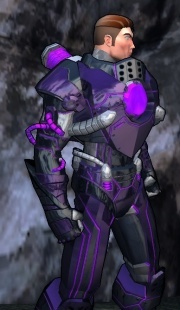 A picture Arc retrieved which he believes to be of his younger self in the armor he used at some point before his memory was erased. After several months he returned to find Millennium City a much different place. Many of the younger, newer heroes had done well in cleaning up Westside. He found he still had access to the Union Tower and continued to live there for a time, alone for the most part. After a few occasions helping UNTIL deal with situations he was asked if he would be interested in applying to a special program they had initiated after having lost many agents. He began initial training through the winter and in February of 2011 was officially made an UNTIL Agent. His local duties consisted of liaising between UNTIL's local agents, heroes and emergency services. Once every month he was also sent out on rotation to assist in field operations, usually on Monster Island but occasionally elsewhere. He continued this contentedly enough, if a bit frustrated by the amount of time he now spent behind a desk. 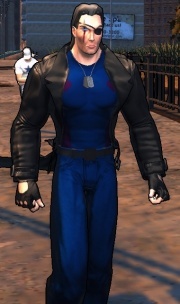 Then in late spring rumors began to persist about an anti-mutant/anti-meta agenda, the Institute for Human Advancement was becoming much more vocal and a small but growing portion of average citizens were becoming disillusioned and dissatisfied with metas, human or otherwise. Then, Jill McFarlane asked him to come as representative of UNTIL and assist in keeping the peace, which he did reluctantly, at an IHA rally which was targeted by an orbital strike. After the situation was dealt with properly by the Millennium City Police Department, with the assistance of Arc and one or two other heroes, despite calls from others present there, Jill brought two other former Prometheus Union members to talk to Arc. It was then that together Jill and Arc, with the help of a handful of the old Union members, restarted the Prometheus Union and began personally recruiting hand-picked mutants, aliens and other metas who were often shown undeserved discourtesy and distrust by others. Though neither really claimed leadership both chose to take action and try and run the group, as acting co-leaders. Over the summer of 2011 the Prometheus Union was able to discover the source of some of the nastier technology being used by the returning threat UNTIL has taken to calling the Xeno-Terrorists, for their habit of targeting aliens, mutants and others who are 'different'. The 'new' Prometheus Union fought these Xeno-Terrorists at every opportunity to the point of making themselves targets, inspiring the creation of Meta-Hunter Robots whose sole purpose was to catch or kill mutants and aliens. Luckily, thanks to their efforts working together, the group was able to put a stop to the threat of the terrorists and their robots. After things quieted down on that front and with all of the work the hero known as Azunai put into organizing and equipping the group Arc saw he wasn't needed, and with his growing duties with UNTIL knew his time would best be spent refocusing on his work. Arc left the group without comment to any of the members feeling it was better for the group to focus on their own activities under the veteran leadership and with the technical prowess of Azunai guiding them. Arc Thunder through his inherited mutation can absorb, project and manipulate electrons and ions near him, especially in direct contact. He can actually sustain himself for a period of time on electricity alone, though eventually he can and will starve if he does not eat food or dehydrate if he does not drink fluids. Arc Thunder has very fine control of his powers. He has learned to 'teleport' in a manner that has something to do with his ability to manipulate electricity though he himself doesn't understand the actual process other than simply doing it. Not only can he teleport himself but also anything in direct contact with him, including clothing, small to moderately sized objects, even other people. The further he attempts to 'hop' the larger the strain on him. His ability to manipulate electricity is finite however, and the more impressive the display the more he will require sustenance or recharging. Arc Thunder's other mutation is a significant healing factor, which is fueled by a very high metabolism. He has always been able to (as far back as he can remember and any records he's recovered show at least) recover from wounds that would be fatal to a normal human being. In one particularly harrowing experience he even managed to survive a plane crash, standing in the cockpit of a 747 passenger airliner when it smashed into the ground in an uncontrolled landing. He was flung from the wreckage through the cockpit's windows and skidded along the ground himself for about fifty yards. He spent almost a two full days recovering from the wounds and another eating heavily to replenish himself. To date that is the most grievous injury he has suffered, at least that he can remember. He often mentions it when asked if he's up to the task by less experienced heroes and as a reminder of how dangerous the line of work can be. He would say that the next most grievous injury after that he has recovered from was being punched into a mountain by Grond while working alongside other forces in an attempt to subdue the force of nature. While the force of the blow and the impact of his landing three quarters of a mile away broke nearly every bone in his body Arc considers the fact he survived a direct blow from the menace as a badge of pride. Often times Arc, being aware of his ability to recover from nearly fatal injuries, will throw himself into the line of fire directly to prevent civilians as well as other heroes from being injured. While he can recover from the injuries, he does still feel all the pain that any normal person would. Though he does take hits for others frequently, he doesn't do it lightly. Another effect of his Regeneration and Metabolism (which are tied together) is that he is highly resistant to disease, sickness or mind/mood-altering substances. It is practically impossible for him to get drunk, anesthesia wears off too quickly to be of significant use and he would need to be heavily overdosed with tranquilizer to knock him out, even then the effects would not last as long as they would on most humans. 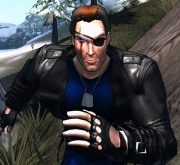 Arc often finds it odd that people, even those aware of his regenerative capabilities, often focus on the eyepatch he wears over his left eye socket, yet never ask him about the livid scar creasing his right brow and cheek, running over his one good eye. There is a reason both the left eye and the scar have never healed but he never brings it up, in fact only a handful of people have ever dared to ask him about his 'permanent' injuries. One area that he is often underestimated in, often by design, is the suite of cybernetic alterations he received in his murky past. He himself didn't discover them until after surviving 'electrocution' from a fallen transformer post and its lines. Over time and through experimentation he has learned to use them well. -Augmented neuro-muscular coordination and responses combined with reinforced joints- These not only assist him in teleporting (though he can't explain the mechanics himself) but also allow him to move-after gathering his energy-at incredible speed. Running consumes far less energy than teleportation but is not quite as fast, he often uses it as his primary method of travel. -Encryption/Decryption and Telecommunications Suite connected through a neural lace to his brain and tied to a receiver/transmitter implanted beneath the skin on the right side of his face- This allows him to directly receive and transmit on most standard frequencies, including encrypted ones if he can directly access the encryption or get an encryption key. This Suite is always running and unless he deliberately chooses to block incoming signals he will continue to hear them. He has often woken up late at night or early in the morning because someone made too much noise on the Champions Respond and Protect frequency which he almost never squelches, in case of emergency. -Direct Crystal-Gel Optic Data Retrieval and Storage System- Arc can, through the usage of a 20' cable that is sheathed along his spinal cord directly download, store and upload data files. The universal port on the end that snakes out from the access point can interface with almost any standardized human technology developed in the last twenty years. The downsides are chiefly that Arc must remain immobile and tethered to any hardware he is interfacing directly with until the process is completed. He can still perceive the world around him but he has to focus on the retrieval and storage of any data he is sending or receiving. Arc has a wealth of experience, not only with his powers but in having seen and lived through much (as far back as he can remember) and even some of the training he went through in the period of time which he can't remember he still retains. He has also spent a great deal of time trying to look into his forgotten past and has not lost his touch with investigative techniques. His cybernetic enhancements make dealing directly with data stored electronically much simpler for him. He has very fine control of his power to manipulate and generate electricity, he has attempted (after much practice) to use his ability to act as a defibrillator on three occasions-two of them successfully resuscitating the individuals, the third unfortunately he was not able to. Arc can also put out a great deal of electricity when he wants to, having helped tackle larger threats many times. He abides by the law and if he does have to face criminals and villains he always tries to resolve the situation with the least amount of force necessary, he even talked a man down in a hostage situation and convinced him to surrender to police. Several times he has taken charge of a situation seeing heroes in over their heads though he generally prefers to let others lead the charge if he can help it. His leadership qualities and personality tend to inspire respect amongst his fellow UNTIL Agents though he himself doesn't feel it's deserved, it has been noted by his superiors. He also has been through all of the rigorous training of any UNTIL Agent. Arc Thunder is generally a man of few words, his western accent and generally business-like manner tend to come off as a gruff exterior among people who don't know him personally. He has a dry sense of humor and a sharp wit but he often keeps his thoughts to himself and tries to let other people do the talking while he does the listening. He has been known on occasion to rebuke heroes for excessive use of force or underestimating criminals and terrorists, especially VIPER whose work he has become all too familiar with seeing as an UNTIL Agent. He does this mainly out of concern for the heroes themselves as well as innocents who could be caught in the crossfire. Arc is also a generous man, though he doesn't make anywhere near the annual salary of someone like the Blue Bruiser, he donates money to several local charities that work with the unemployed, homeless and hungry of Westside as well as spending free time when he's not walking the streets of Millennium volunteering at the soup kitchen he himself frequented the most when he himself was homeless. He spends as little of his free time at 'home'-wherever that may be at the time-as possible, preferring instead to be out helping the disenfranchised or scaring away troublemakers in Westside. He sleeps on a couch or in a chair, never in a bed, if he has any say he'd take the floor over a bed. Living for so long without the luxury of beds he actually has trouble sleeping in them, also as a habit from his long period of homelessness he generally goes to sleep in whatever he was wearing that day, unless he comes home in UNTIL uniform in which case he will change to a t-shirt and jeans. Arc generally doesn't speak about his past unless asked about it and most people don't ask. He struggled with confidence in himself for a period after his memory was lost but over the years he got over that and only in the deepest subconscious recesses of his mind do his doubts and fears still linger. They were rekindled for a time after he came to Millennium when, after stopping an attempted bank robbery, two of the perpetrators split up. He was only able to catch one, the other killed a man and took his car to get away. The decision of going after the wrong one still haunts him in his dreams every once in awhile, logically he knows it was not his fault but emotionally he still holds himself responsible for the failure to save the innocent person and stop the other one who got away. Consciously he chooses to look at that failure as inspiration to strive and do better, to prevent himself or other heroes from doing something (or not doing something) that would cause or allow harm to come to an innocent person. Most of his dreams however are a fog of half-remembered and/or half-imagined events from his forgotten past, probably the worst is an incident which he only remembers in his dreams, the loss of his left eye and the subsequent surgery which left him with the scar he still carries to this day, despite his body's regenerative abilities. He is aware of an alleged account of what happened but he does not consciously recall the incident himself when he's awake, it's possible hypnosis could cause him to remember it though doing so would be extremely painful for him. He has tried several ways of returning his memories and at best they have only really helped to fuel his dreams and nightmares. To friendly acquaintances and the handful of people he himself considers friends Arc is warm and supportive, always willing to lend an ear. He likes spending time with other people and though he doesn't tend to socialize much outside of normal 'hero work', he has tried to get to know many of the newer faces and voices of heroes who are active in Millennium City. This often comes as a surprise with how he tends to come off as gruff to people who don't know him very well. Though he tries to restrain his eating habits around them he is always a bit self-conscious about how much and how fast he consumes food in front of others, especially his friends. This page was last modified on 4 October 2013, at 14:42.